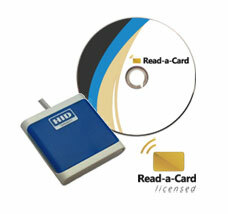 This complete hardware and software package comes with a pre-licensed Omnikey 5021 CL USB contactless reader. The software can be installed and run on any Windows PC, as long as the reader is present. The Omnikey 5021 CL supports all popular MIFARE, DESFire and NFC cards and tags as well as HID iClass (including Corporate 1000 but excluding iClass SE, Seos and Elite).